Auckland is globally renowned as one of the world’s finest fishing locations. Being situated on an isthmus it provides easy access to the local Hauraki Gulf as well as the Pacific Ocean and Tasman Sea. Having over 15,000 miles of coastline you are relatively spoilt for choice when choosing where to take a fishing charter. So what sort of target species can you expect to be fishing for? Regarded as the most popular fish in the region, snapper can potentially weigh up to 22kg. You can fish for snapper all year round but the best season is from December until June. Snapper is actually a general name for several species of fish. They tend not to fight much and so are not as difficult fish to catch as some of the others in the area. They are known for their delicious meat and this is what makes them such a prized catch. These fish are green on their top and white underneath with yellow tails and a goldish band down their sides. They are usually found around depths of 200metres. They have unfortunately been overfished to a certain extent and are not as common as they once were. 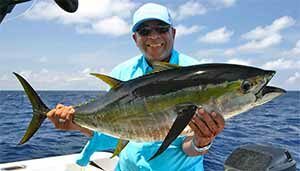 October to December are regarded as the best months to fish for Kingfish by many avid fishermen as they are at their most aggressive and you have the best chance to catch big ones, with weights of up to 30-40kg. January brings the start of the Marlin season around New Zealand. As the warmer water to the north spreads down towards Auckland so with it comes the Marlin. 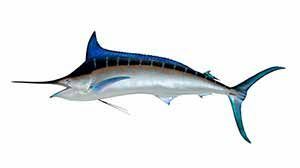 There various species of marlin which can be caught in the waters around Auckland including Blue Marlin. These fish swim at a great speed of around 80kph and have been recorded at weights above 400kgs. Boasting iridescent colouring of green, silver and blue, Trevally can be found quite readily around the North Island. They are fast swimmers and very popular as bait for catching larger fish. Although quite rare Giant Trevally can be found around this area and are quite a prize catch. Renowned for their delicious meat, gurnards can usually be found around shallow, muddy sea floor areas where they feed. The best season to finish for them is the winter. Due to the unusual croaking noise they make, some people refer to them as the frogs of the sea. These fish can grow to large sizes of up to over 180kg. They are widely sought after by fishermen due to the fact that they are valuable, strong and prove to be quite a battle to catch. Also known as Eastern Australian salmon, these can be caught on various Fishing Charters in Auckland, New Zealand and the surrounding region. They have a bluey-green body and tend to weigh between 1 – 2.5kg although you can find larger ones. They are known for jumping and fighting hence the Maori, Kahawai which means “strong” or “brave” water.